U-ziq (the "u" here being the Greek letter mu, which is obviously not on my keyboard) can happily stand by the side of Aphex Twin and Squarepusher as one of those 90's "Intelligent Dance Music" guys. His work was characterized by a very desperate intensity woven between the quick, almost random beats you'd expect from the movement. He hit a peak around 1997's fantastic Lunatic Harness -an album containing one of my all time favourite tracks, "Hasty Boom Alert"- and since then slid steadily down a quite shallow hill before his musical journey stopped just six short years ago. Good news from Planet Mu this week: he's back. 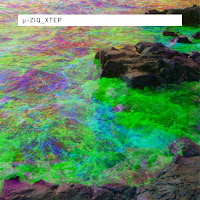 May 20 will see the release of XTEP: a five track EP showcasing the kind of thing to come from u-ziq in the future. Samples can be streamed on their website (although the full EP has also been leaked in record time, sadly), and he seems to be taking a much more modern, simple but no less subtle approach. It also appears you might be able to dance to a few of the tracks. IDM you can dance to? Who'd have thought? May 20 can't come soon enough.